This is actually the back of the shirt shown in example 21. I placed an aluminum baking sheet between the two layers to prevent bleed-through. Aluminum must not be allowed to contact damp soda ash, as the high pH degrades aluminum badly (as does a low pH). Though exposure to the dry soda ash in this case appears to have done no harm, even this should not be attempted with a baking sheet you plan to keep. Wet soda ash in contact with aluminum may ruin not only the aluminum, but also any fabric in contact with it. I made use of a large plastic drafting triangle to help draw the pencil guidelines for this design. 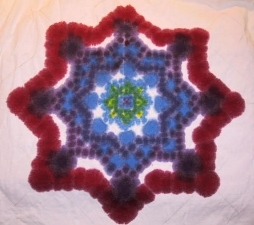 I drew concentric circles as guides to then draw squares which formed the basis for the eight-pointed stars. 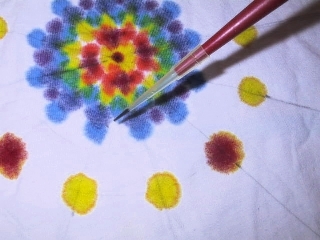 As on the previous page, I used an Eppindorf automatic pipettor (non-electronic, mid-1980s model) to drip carefully metered droplets, from 5 to 200 microliters each, depending on the size of dye dot desired, onto a cotton knit shirt which had previously been soaked in a solution of 1 cup (250 ml) of soda ash in 1 gallon (4 liters) of water, then line-dried. 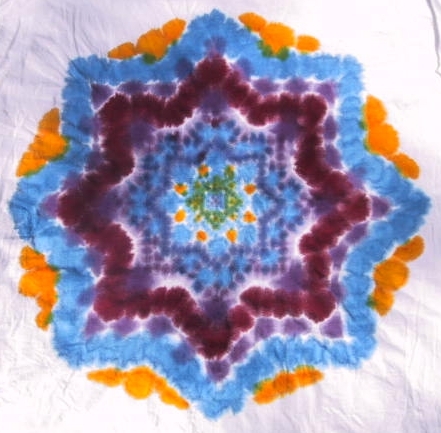 The dyes were Procion MX type dye, mixed at approximately 4 teaspoons (20 ml), by volume, per cup of water, along with 1 tablespoon (15 ml) of urea per cup of water; more was used for black and turquoise. 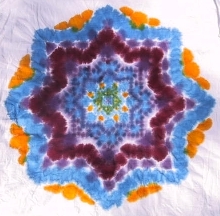 I dyed the background after dyeing the mandala. This was, in my opinion, a mistake. In the future I will dye the background first, then fill in the mandala, to avoid messing up any of the fine details of the mandala itself.